It seems like every time you start you get one step forward to then take two steps backward again. You dive into a new regimen and injure yourself. You feel like you are doing everything right and yet the scale won’t budge a bit. I totally get it. Even on your best days, you may find yourself wanting to throw in the towel, eat all the things, and give up on ever making progress. STOP! No self-sabotage allowed here. You may need to hit pause, take a step back and re-evaluate what you are doing. Maybe something is off, or your plan/program isn’t the best fit for you. It’s always a good idea to evaluate what is or isn’t working for you. This is something I am always working into my coaching-let’s not keep moving in one direction just because we thought it was a great idea in the beginning. BUT, before you even take the time to think through that, let’s work on the foundation of your motivation! 1. Establish your Core Motivation. Take what you want to accomplish to why you want to accomplish it. Ask yourself first, What do you want to accomplish? Then, Why do you want to accomplish that? Explore this idea-why is it important to you? What will that change for you? What kind of difference will that make in your life? What is the story behind it? And lastly, How does that make you feel? Spend extra time on this first step. 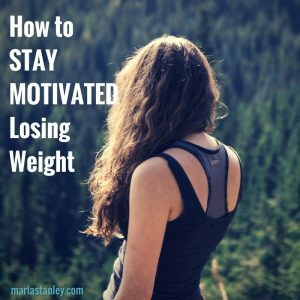 It’s truly the most important and foundational step to help you stay motivated when nothing seems to be changing! 2. Identify your Intrinsic Motivation. Dani Johnson’s GEMS training is ideal for understanding your intrinsic motivation. She describes our personality types based on our motivation as gems–each of us having a unique brilliance and character that all come together, and working together our strengths are all magnified. These “gem” types help us to choose the best structure, setting, and programming to help us reach our goals so that the logs we are adding to the fire of motivation help fuel the fire instead of dampening it. 3. Choose a Plan (& Follow Directions). Any plan can work. Unless you have a very specific health problem or diagnosis where you need a particular diet or have to avoid a certain type of exercise, the basics of weight loss are the same-create a caloric deficit and your body will do the rest as God designed it to do. Nutrition-do you know what to do with your diet? Exercise-do you know how to exercise your body? Mindset-do you know how to maintain a long-term success mindset? Consider: Knowing my intrinsic motivation and the feelings driving my desire to get fit, what’s the best plan for me? First, You need a relationship with your Creator. Only He can satisfy your soul and deep desires. Second, You need a connection to a community of people who are in the fight with you. 5. Use the HeartCore Method™ to Stay on the Right Track! My HeartCore Method™ is founded in the reality that we do not lose weight or transform our health in a vaccum, but our health begins on the inside, and we have to train our bodies for life. 1 Timothy 4:7 tells us to ultimately train ourselves for godliness. While there is some good and profitable in our physical exercise (1 Tim 4:8), we want to strive for goals worthy of eternal promise! Here it is: train your heart for purpose, your body for action, and your mind for success. Wait? Why the mind? Paul clearly instructs believers to, “not be conformed to this world, but be transformed by the renewing of your mind…” (Romans 12:2) This is so crucial for your long-term motivation. Just as significant as the first step is, applying this entire HeartCore Method™ to your journey will make all the difference as you keep the fire of motivation blazing even if (when) you hit walls! Need help with this? Reach out! I’m totally here to help and share what has worked for me, and happy to refer you to the best fit for you.